[Packing Size]Type:1 dose/bag;10 doses/box,20 doses/box,25 doses/box,40 doses/box,50 doses/box. [Intended Use]It is used for diagnostic of anti-HAV-HEV IgM from human serum(or plasma) and can be used clinically. Hepatitis A is an acute transmitted disease infected by hepatitis A virus(HAV) which belongs to picornaviridae, hepatovirus. It is transmitted through feral-oral route and commonly seen in children and teenagers. Hepatitis A is self-limiting and rarely seen as chronic infection. There are 7 gene types of hepatitis A but there is only one serotype of HAV. So there is only one antigen-antibody system, which is antibody IgM and igG. IgM appears earlier and can be lasted for 8-12 weeks and in a few cases it can be lasted for 6 months. IgG can be lasted several years and is mainly protective antibody. Hepatitis A can be transmitted in three ways:(1)Daily life contact;(2)Aquagenic transmission;(3)Food. Otherwise, fly and cockroach is the main vector of the disease. Hepatitis E(HE) is an acute transmitted disease caused by HEV and infected mainly through water and also food and daily life. It is formerly called enterically transmitted non-A, non-B hepatitis, leading to eruption or epidemic, and also sometimes sporadic. The mortality of HEV is about 0.5%-1.5%, a little higher than that of HAV. But the mortality of HEV in pregnant women can reach to 20%.China is among the high prevalence country in the world and take up 10%-20% of all cases with hepatitis. There are 4 gene types of HEV and type 1 gene is most commonly seen in developing countries, such as China and some African countries. Type 2 gene is found in Mexico and some African countries; Type 3 gene is discovered over the world and can be tested in many cases with acute hepatitis which are out of Africa; Type 4 gene is found only is Asian. Type 1 gene is with highest prevalence in our country and type 4 gene can also be tested. There is so far one serotype of HEV. The anti-HAV-IgM kit depends on capture method and gold immunochromatography assay. The HAV antigen and mouse monoclonal antibody are coating in polyester fibre(or non-woven fibrics) and the test lines with nitrocellulose membrane and control lines are coated with human IgMµ chain monoclonal antibody and IgG antibody separately. When the positive samples are added, the IgM antibody of HAV virus in the serum of plasma can combined with the HAV-antigen in the colloidal gold. The compound can move forward due to the chromatography effect and form ‘Au-HAV Ag-HAV anti-human IgM Ab’ with pre-coated anti-human IgMµ chain monoclonal antibody when passing the testing lines. As a result, the lines turn to be amaranth. In the control lines, the free gold standard mouse monoclonal antibody can attach to the anti-mouse IgG antibody and make the control lines amaranth. But in the negative group, the amaranth is only found in control lines. The anti-HEV-IgM kit depends on capture method and gold immunochromatography assay. The HEV antigen and mouse monoclonal antibody are coating in polyester fibre(or non-woven fibrics) and the test lines with nitrocellulose membrane and control lines are coated with human IgMµ chain monoclonal antibody and IgG antibody separately. When the positive samples are added, the IgM antibody of HEV virus in the serum of plasma can combined with the HAV-antigen in the colloidal gold. The compound can move forward due to the chromatography effect and form ‘Au-HEV Ag-HEV anti-human IgM Ab’ with pre-coated anti-human IgMµ chain monoclonal antibody when passing the testing lines. As a result, the lines turn to be amaranth. In the control lines, the free gold standard mouse monoclonal antibody can attach to the anti-mouse IgG antibody and make the control lines amaranth. But in the negative group, the amaranth is only found in control lines. 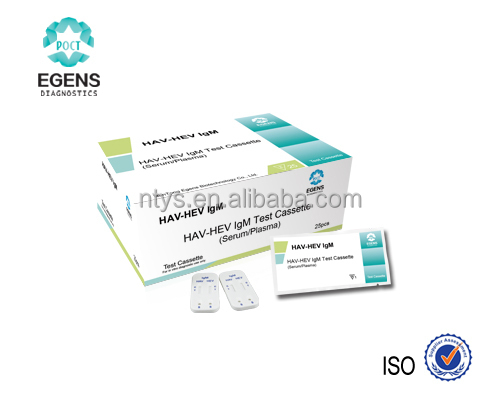 Made up of HAV IgM testing antibody cards, HEV IgM antibody testing card, plastic card, desiccant and suction tubes. HAV testing cards are made up of plastic substrate, colloidal gold pad, loading pad and absorption pad. Gold-marked HAV antigen and mouse monoclonal antibody are pre-coated in colloidal gold pad and the test lines with nitrocellulose membrane and control lines are coated with human IgMµ chain monoclonal antibody and IgG antibody separately. HEV testing cards are made up of plastic substrate, colloidal gold pad, loading pad and absorption pad. Gold-marked HEV antigen and mouse monoclonal antibody are pre-coated in colloidal gold pad and the test lines with nitrocellulose membrane and control lines are coated with human IgMµ chain monoclonal antibody and IgG antibody separately. It is protected from light and dry place and is without frozen. The period of validity is 24 months from production. It can be stored in 65% humidity for one hour after it is unsealed. It should be used immediately if the humidity is above 65%. 1. The venous blood should be sampled aseptically and separate the serum or plasma as soon as possible to avoid hemalysis. 2. The fresh sample should be used. It can be stored in 2-8℃ for 7 days if the sample cannot be used immediately. It is be stored in -20℃ for long-time preservation and cannot be frozen more than 3 times. 3. 0.2mg/ml heparin, 150mmol/L EDTA-2Na and 2.5% sodium citrate do no effect on the test result. 4. The sample should not used if it is hemolytic. 5. 0.1%NaN3 has no effect on the test result. You should read the instruction thoroughly before using. 1. Take the sample out to room temperature and number them. 2. Dilute the serum or plasma 1:100 with dilution (take 2 ul sample to 198ul dilution and mixed thoroughly). 3. Take the card out from the box, open the aluminum foil and put the card on the table. 4. Suction the diluted serum or plasma with suction tube and put 2 drops to the pore. 5. Positive samples can be tested in 1-15 minutes and it is suggested to take the records in 15 minutes. It is no use of the result after 20 minutes. The testing lines and the control lines of the HAV-IgM antibody testing cards turn to be amaranth. The positive results suggest that the HAV-IgM antibody is in the sample. The testing lines and the control lines of the HEV-IgM antibody testing cards turn to be amaranth. The positive results suggest that the HEV-IgM antibody is in the sample. The testing lines of the HAV-IgM antibody testing cards turn to be amaranth. The positive results suggest that the HAV-IgM antibody is not in the sample. It indicates inappropriate procedures or loss of efficacy of the kit f the control lines do not turn to amaranth. You can re-read the instruction and take a new one to test again. If it still do not solved, you can contact the local suppliers. 2. The amaranth in the control lines is a control standard to make sure if the appropriate procedures and correct results are applied. 3. In testing different samples, the varying depth indicates the varying concentration of HAV-IgM or HEV-IgM. But, in set time, no matter the depth of the color is, it should be judged as positive. 1. It is an accessory method of clinical use and the result can only be used for reference. To diagnose the disease, you should combine patient history, clinical examination and other tests. 2. The negative results can not eliminate the possibility of HAV or HEV due to the limited sensitivity. It is possibly because the concentrations of the antibody in the samples are lower than that of the sensitivity. You should use a method with higher sensitivity for the doubted negative samples(such as EIA). 1. 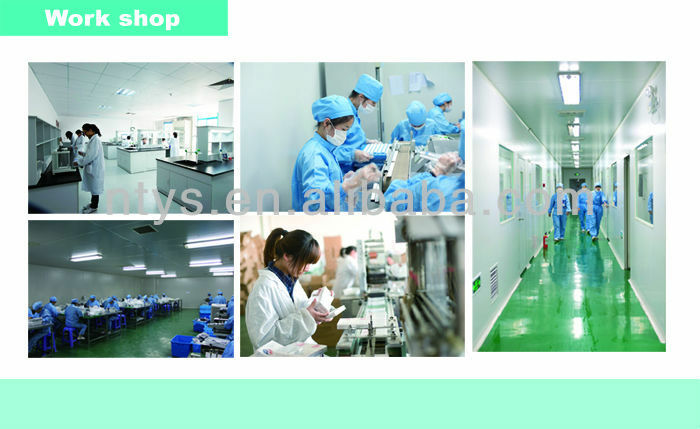 It is a in vitro diagnostic test and only human serum or plasma are appropriate. It is unlikely to get accurate result with other body fluid and samples. 2. The test should be carried out in wind-free environment. Hyperpyrexia, hypopyrexia and over-dry environment should be avoided. 3. The testing cards should be used as soon as possible once it is opened. Excessive time in air can lead to damp and loss of efficacy. You should stop using it if the inner packing is broken. 4. The kit can be store in room temperature to avoid being damped. If it is stored in hypopyrexia, it should be put in room temperature for a while. 5. The test should follow the epidemic labs protocols. 6. There is no sample can be totally free from anti-HAV IgM or anti-HEV-IgM, so the negative results can not eliminate the possibility of the infection. 7. This is a primary screen test, so the positive results should be further confirmed. 8. Samples with HBV, HCV, TP, HIV and rheumatoid factors do not affect the result. 9. Number the sample is significant in massive tests. 10. The test card is used for disposable in vitro examination and cannot be used repeatedly. It should not be used after frozen or over the period of vadility.